Son: How are you feeling, mom? Me: Ah, fair to middlin'. 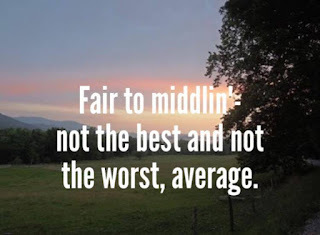 Me: Fair to middlin'....it means so-so, average, okay. Son: Then why didn't you just say average. I figured that if he didn't know what it meant then there might be a few of you who didn't know either. 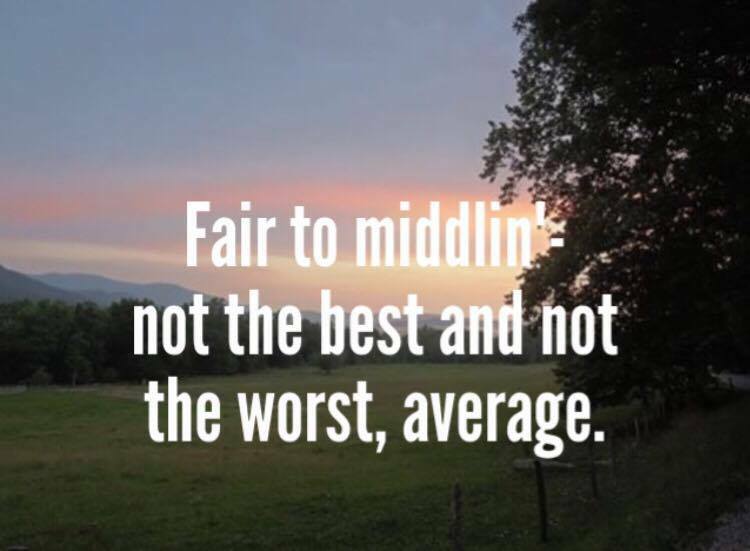 Just like many words that end with -ing in Appalachia, middling got whittled down to just middlin'. Middling is a term used by farmers to identify the quality of products such as flour, sugar, produce, and cotton. For cotton, the specific grades ran from the best quality (fine), through good, fair, middling and ordinary to the least good (poor), with a number of intermediates, one being middling fair. While the phrase is still used this way, it has also worked its way into everyday conversation. It is a phrase that I hear and use quite often. Have you ever heard or used this phrase?